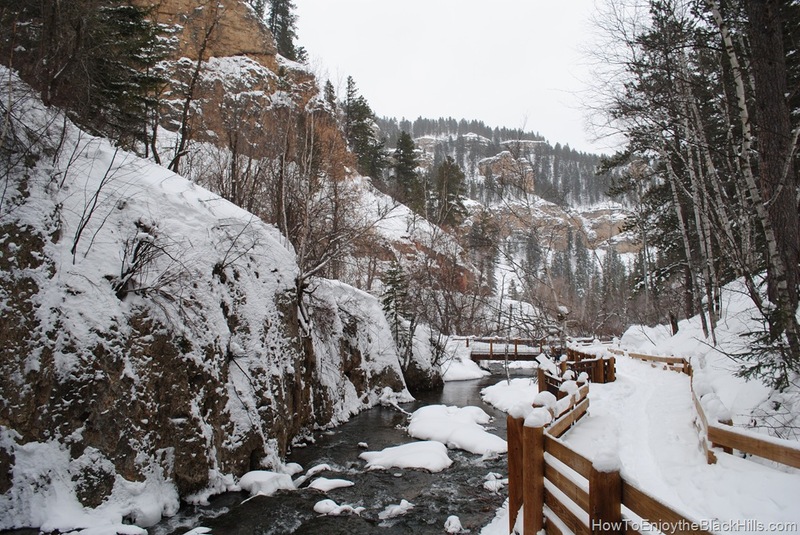 Roughlock trail is another great Black Hills hiking trail that is a perfect place to snowshoe in the winter. This is an easy hike, just one mile to the falls from Spearfish Canyon Lodge and only a gain in elevation of about 150 feet. In the winter, the road to Roughlock Falls is closed to automobiles from December 1st to March 31st. So, if you’d like to see the falls in the winter, you can snowshoe the Roughlock Trail or take snowmobile. You can’t go wrong either way. The trail follows Little Spearfish Creek to the falls. There are plenty of photo opportunities and you’ll mostly likely see some wildlife. You’ll find the trailhead in the parking lot behind Spearfish Canyon Lodge, watch for the signs. Want more information about Roughlock Falls Trail and the area? Other trails in the area include: 76 trail, Little Spearfish Falls Trail and Old Baldy. Other trails for snowshoeing in the Black Hills include: Eagle Cliff Trails, Englewood Trailhead and Iron Creek, plus many more.